Good Morning world. It is GOOD FRIDAY! In my book, all Fridays are Good Friday. But this Friday the Blonde Bunny and I will be celebrating with a bevy of fabulous friends at the LAW Good Friday Crawfish Boil. 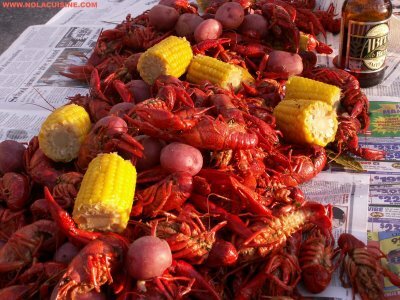 Our afternoon will include the holy trinity of crawfish, potatoes and corn. Throw in some sides, some cold drinks and a crazy bunch of people with a jam box and you have yourself one heck of a religious experience. It’s a time to be thankful. It’s a time to be reborn. Good Friday and Easter – It’s not just the resurrection story of a man who came and gave his life on the cross for our “Sins” and then arose three days later. It’s not just about what someone did for us! It is a map – a guideline, an example of how to renew your own life and be born anew. Change is hard. Letting go of your burdens is difficult when you feel that only your burdens define you. Instead of pointing the finger of blame at those around you for being the source of your discomfort or for being the barrier to your success – “forgive them, for they know not what they do”. YOU have the power to release and forgive them because only you have the vision of who you truly are. There is no room for judgement or grudges in the Kingdom of Heaven. And the Kingdom of Heaven is within you. Let the past die away, enter the chamber of your heart and rest in the new ideas of love, forgiveness and peace. See the obstacles that block your path dissolve away. Forgive YOURSELF for not believing in the power and wonder of YOU and the God within you. Only then can you awaken to a new life. Only then can you accept the wonderful gifts that were meant to be yours all along. Only then will you live your best life ever!